How do you map the ocean floor? Who created the first map of the bottom of the sea? Cartographers were putting the depths of the ocean on the map long before Google Street View provided their very first underwater panoramic images of the Great Barrier Reef, and the Apple map app shipwreck. 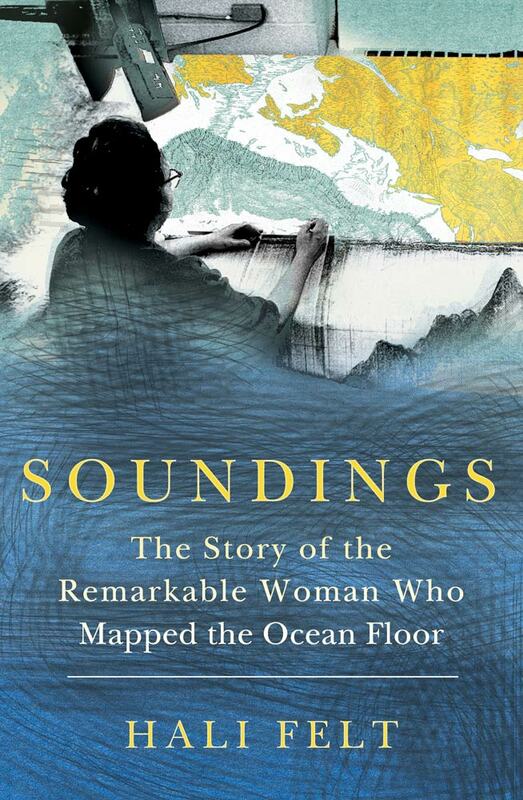 The book, Soundings: The Story of the Remarkable Woman Who Mapped the Ocean Floor, by Hali Felt, tells the story. If you are interested in exploring the history of women in science, and the changes in scientific thought over the last century, then this book is worthy of your time. Hali Felt brings Marie Tharp and her partner, Bruce Heezen to life. The biography paints a picture of a unique and remarkable person, how she came to be, and her accomplishments before the digital age, when a woman was not invited, or acknowledged, in the scientific community. Marie Tharp’s physiographic diagrams of the ocean floor, illustrated to the world, the theories of plate tectonics and continental drift. The story involves a lot of politics and drama in the scientific community. It makes me glad that I decided to go into the family map printing business, instead of academia. 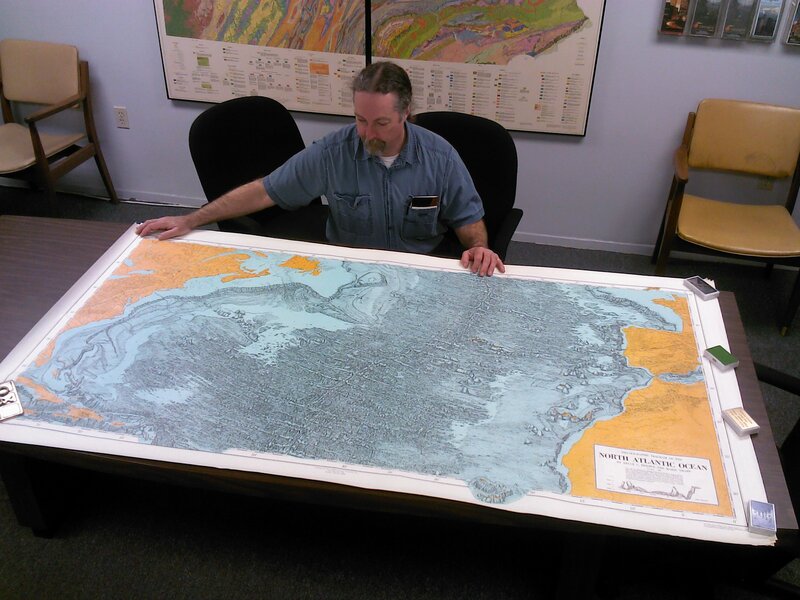 I loved Soundings: The Story of the Remarkable Woman Who Mapped the Ocean Floor, Hali Felt’s biography of Marie Tharp, and not just because she wrote about Williams & Heintz Map Corp. My dad used to talk about Marie’s visits to have us print her maps. He described her as “quite a character”, a unique and colorful individual, bubbling over with personality. It was a joy to find Williams & Heintz, my dad, and grandfather mentioned in the pages. In the fall of 1961 the Geological society of America published Marie and Bruce’s second physiographic diagram. This diagram showed the South Atlantic Ocean, included the Caribbean and Scotia seas, and the eastern margin of the South Pacific Ocean. Marie spent four years (from 1957, when she finished the North Atlantic, until 1961) drawing the floors of these oceans, which had never been done before; it took her only ten months to re-create the land masses surrounding the oceans, all of which had been well documented before. When preparing these diagrams, Marie followed the same method she’d used when drawing the North Atlantic: plotting profiles, examining adjacent tracks for trends and regional characteristics, sketching the relief of the terrain along the profiles, and filling in blank areas by extrapolating and interpolating. In July 1961, while the physiographic diagram of the South Atlantic Ocean was in the process of being printed at the William and Heintz Map Corporation in Washington, D.C., Marie wrote three letters to Bruce. These letters show how deeply invested she was in what happened to her work when she was finished drawing. After making a trip to D.C. to meet with the printers, she went to Ohio, where her brother had carried on at the farm in Bellefontaine after their father’s death. Marie never mentioned, in her letters from July 1961, all the new features that she had exposed for the first time in her map of the South Atlantic. What would she have said anyway? Also I should like to point out that we showed the Equatorial Mid-Ocean Canyon, which debauches into the Pernambuco Abyssal Plain, for the first time? Also I should like to note that we showed the Ameghino Canyon, off the coast of Argentina, and the submarine canyon of the Orange River, off the coast of South Africa? Also I should like to remind you that we discovered the Romanche and Chain fracture zones? Bruce didn’t need to know these things, but in order to know the importance of her work, we do. I wrote previously about Marie Tharp here.